memcached (pronunciation: mem-cache-dee) is a general-purpose distributed memory caching system that was originally developed by Danga Interactive for LiveJournal, but is now used by many other sites. It is often used to speed up dynamic database-driven websites by caching data and objects in memory to reduce the number of times the database must be read. Memcached is distributed under a permissive free software license. So basically it allows you to create a distributed memory cache across your server farm, that allows any computer in the server farm to access the data in the cache. So there is no more issues with storing session data on server farms, or worrying about setting up common SQL stores of temporary data. This is also very practical for reducing database stress on Web 2.0 sites, many of the top Web 2.0 sites use this to reduce reads on the database. The biggest user of memcached to date is Facebook. 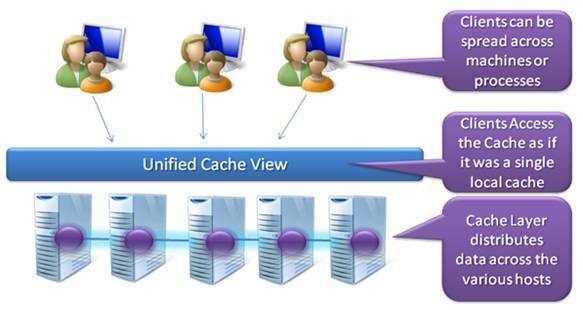 This diagram below gives a basic idea of how distributed caching works. Velocity is intended to provide distributed caching (in memory) for all .NET applications – from enterprise scale to web-scale. We believe that there are many applications that need a distributed caching mechanism, and that there is, therefore, a need for distributed caching as a core part of the .NET platform. We expect to have more integrated support for this functionality with other parts of the .NET platform in our upcoming releases. There is also a pretty nice Velocity writeup on MSDN that goes in depth about how Velocity works as well as providing some basic code examples on how to get data into and out of your Velocity Cache. The current set of features looks pretty nice, and I can't wait for Velocity to become more stable so I can introduce it in to the IdeaPipe mix.